Remember where you learned it first! 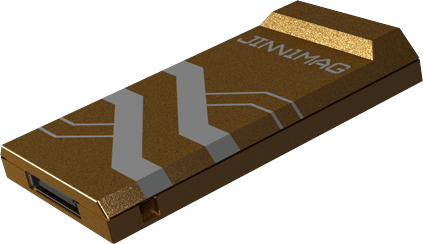 JinniMag® is a high quality, high capacity, third party RED® media that is fully compatible with RED Mini-Mag® but comes for a fraction of the price of its RED® counterpart. It's challenging for some independent filmmakers to get their hands on a decent cinema camera, and when it comes to the RED® cameras, buying its expensive media is yet another financial challenge to take on. Especially if you're handling a serious production that requires a good number of RED® mags to go around for dailies and in and out of colourist, editor and VFX offices. With RED® cameras becoming more accessible to people via release of new line of cameras such as Raven and Scarlet-W, as well as it's high-end 8K cameras demand for larger capacity media, it is the right time to have more affordable alternatives in the market. And so JinniMag was born! Quality product from the United Kingdom! JinniMag uses multi-dimensional non-volatile storage cells with a combination of technologies empowered by our SSDs world-class architecture and high-performance controller engines boosting the access speed to meet the demands of the modern cameras' 8K resolution, HDRx and High-Frame-Rate requirements. 100 per cent compatibile. Guaranteed! JinniMag is fully compatible with RED MINI-MAG® and whatever camera that works with RED MINI-MAG® should work with JinniMag. Use JinniMag directly on your camera and use your existing equipment such as RED® Station to download your clips on to your computer. So there is no need to change anything in your work flow. JinniMag Mean Time Till Failure is above 1.5 million hours ** device working time. That's about average of 170 years ** before they could run into any possible issue. • Extensive Knowledge Base: We provide pages of categorized technical information, recommended settings, in-depth know how and how-to guides in our extensive Knowledge Base, which will be available online. • Quick turn around RMA: We promise the fastest service humanly possible in case you need to send in your media for inspection, repair or upgrade. • Courtesy like-to-like media: Never stop shooting! In case of RMA we will provide you with free of charge, optional like-to-like courtesy media, so you can carry on with what you do best whilst your JinniMags are staying with us! • Discounted Data Recovery Service: We offer our customers our professional data recovery services at a discounted rate. Please contact us for details. ** Mean Time Till Failure (MTTF) and Average Device Time are measured per batch and not per individual unit. Individual units must pass through our rigorous Quality Control before dispatch. SSD Endurance and other factors have critical impacts on the drive's life span. • Lifetime Compatibility Guarantee: We guarantee that JinniMag works and remain working fully compatible with RED Mini-Mag. JinniMag® is completely independently developed without any affiliation with or endorsement by RED.COM or RED Digital Cinema Cameras, employing publicly available third-party technologies from range of computer hardware manufacturers, plus our in-house developed components. The firmware and other drivers are result of either in-house development or adopted from microchip manufacturer codes. JinniMag is not knowingly in breach of any copyright or patent and not knowingly violating any IP. JinniMag is not affiliated with RED® Digital Cinema Camera at any stage. JinniMag is designed and produced as third party compatible replacement for the original ones. RED, RED MINI-MAG, RED Raven, RED Scarlet-W, RED Scarlet Dragon, RED Weapon and RED logo are registered trade marks of RED.com and RED Digital Cinema Camera.